Asparagus and pesto puff pastry tart is the perfect family snack. 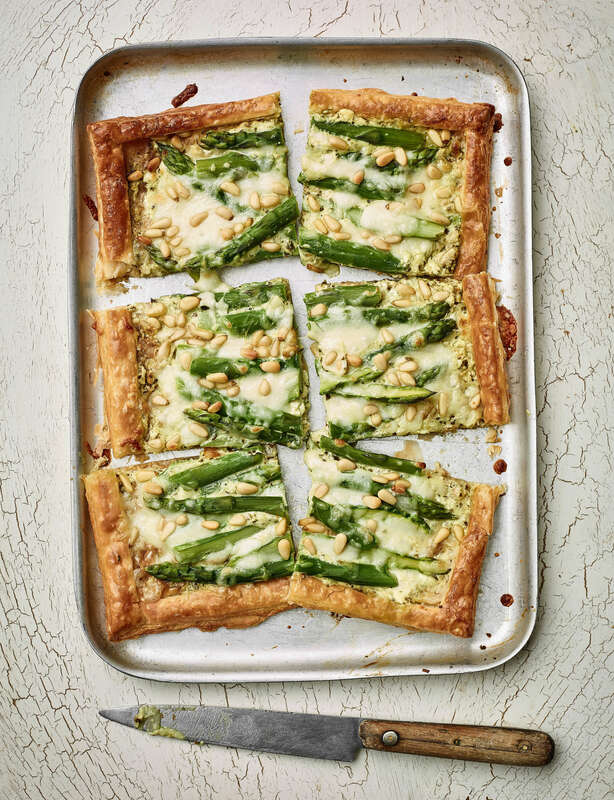 This asparagus and pesto tart recipe was thought up by my beautiful niece Lucy and her mother Lou. I love that they cook together – I know from cooking with Billie how much that bond is strengthened even more through doing something together. Billie and I make heart-shaped versions of these tarts, which look extra pretty! Unroll the pastry and place on a baking tray. Score a border around 2cm from the edge and prick inside the border with a fork. Bake for 15 minutes until lightly golden and puffed up, then remove from the oven and push down the centre of the tart. Meanwhile, blanch the asparagus in boiling water for 2 minutes, then drain and cool under cold running water. Cut each spear in half lengthways. In a bowl, mix the pesto with the crème fraîche and cream cheese and season well. Spread this over the base of the pastry and top with the sliced asparagus, then sprinkle with the grated mozzarella and pine nuts. Brush the edge of the pastry with beaten egg, then return to the oven for 10 minutes until the cheese is melted and the edges golden. Drizzle with oil, scatter with basil leaves and serve.